Tibetan costume features a loose waist, long sleeves, and a big front. People wear fur coats on festivals and big occasions. The color is determined by religious factors, with white, yellow, and red being the most popular. Tibetan costume is mainly composed of a Tibetan robe and a Tibetan-styled shin (a garment covering the front part of the lower leg). Loose and big, the robe is usually longer than one's height. It is somewhat complex to put on and even wear the robe. The man gets into it, holds the robe high, lets the lap drop down the knees, and ties the girdle around the waist. He will only use one left sleeve, and the right arm is exposed out of the robe for farm work convenience. On hot days, they expose both arms and pull the upper clothes down to the waist. Wearing the robe in this manner makes, a man even more handsome. One of the shirt's features is that the left shoulder is larger than the right. There are buttons or colored ribbons on the armpits to fasten the shirt. Men wear white shirts, and women, calico ones. Generally speaking, men's shirts have a high collar, while the ladies' are turndown collars with long sleeves. Of the various styles of Tibetan hats, the most common is the felt hat. The hat's top is decorated with golden silk and the edge is inlaid with silk ribbon. In the middle of the last century, western hats were introduced and have been in fashion in Tibetan inhabited areas ever since. Boots are one of the favorites of Tibetans. Men and women, old and young, all wear boots like those of officials and generals in traditional pageant dramas. Tibetan boots adopt exquisite colors. Some of the insteps are embroidered with silk thread into different designs, while others are edged with golden silk thread. At the back of various boots, a 10-centimeter-long mouth is opened for the convenience of putting on and taking off. Tibetan boots are not only beautiful and tasteful, but also comfortable, durable, and wear-proof. Both men and women wear necklaces as well as bracelets and fingers rings. Metal coins and gems hang on the back of ladies, while men like to wear broadswords, pipes, neck articles, silver coins, and other ornaments. Tibetan costumes are both practical and colorful, serving as a means for Tibetans to show off their wealth. 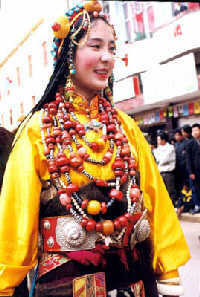 The artistic features of Tibetan costume are demonstrated in many aspects. One prominent feature is accumulative parallelism in colors and designs, which is shown in many cases in Tibetan costume making. Take the fur-lined robe in the pastoral areas for example. It is edged with small upright oblong pieces of green, purple, black, orange, yellow, and red cloth, increasing accumulatively to form colored bands. These colors, arranged in a colored band, gives people a vivid sense of leaping forward. The shoulders, lower hems, and cuffs of the fur-lined robes of women in pastoral areas are often decorated with black, green, red, purple, and other colored stripes arranged in a row to form staid and bold designs, which produces striking and exciting effects.